1. Go to this link and install User-Agent Switcher For Chrome. (If you fail and get an error message saying package is invalid then go to “about:flags” on your chrome and enable “Experimental Extension APIs” . And then restart your browser and then try downloading User agent switcher. 3. 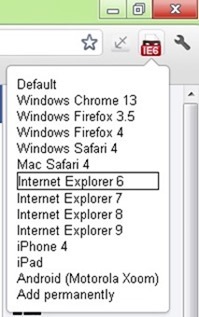 Click on the icon shown in above step and select Internet Explorer 6 as shown below. 4. Now refresh your Facebook page and use Facebook without the Timeline. Note Other Users Will See Your Profile As In The Default Timeline Format. Also leave your comment if any of you had any problem.